Anglim’s Western Metal Works offers welding and fabrication services to individuals and businesses throughout New Mexico. We can work on a project of almost any size and scope, from individual metal sculptures and custom gates to machinery components and prototypes. We utilize state-of-the-art technology for superior efficiency and precision. Our computer-guided (CNC) shearing, cutting, and press brake technology ensure maximum control over the job – allowing us to create exactly what your project demands. A press brake machine makes the bending and shaping of sheet metal efficient and highly precise. The machine utilizes a punch and die to clamp a piece of metal and bend it at predetermined points. 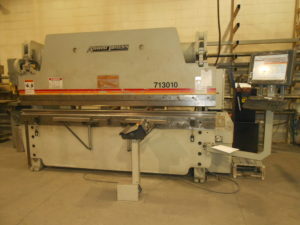 In our case, we utilize a CNC press brake, or computer-guided hydraulic machine, allowing us to input the exact specifications required for your project. This is just one of the CNC metal fabrication tools in our shop. We also utilize computer-aided technology for metal shearing, waterjet cutting. Our dedication to quality and precision is what sets us apart from the competition. Our team members are professional and have experience with a variety of techniques and metal types. We inspect each weld and take pride in clean cuts and welds that will be long-lasting, durable, and attractive to the eye. If you need metal fabrication or other metalworking services, contact us today. We’ll be happy to discuss your project and provide a quote for the work as well as answer any questions you may have to ensure we’re the right team for the job. Need custom metalworking service? Call 505.822.9170!